It seems I have to admit something… Sheena has known for a while but I have been reluctant to be true to myself and have been hiding a secret deep inside. Sheena takes the piss out of me for it, and as much as I really don’t want to it turns out I really love trains. I feel ashamed, but if I come clean then I actually really love them. When I think about it I always have, from when I knocked my front tooth out when I was very young leaning off a stool pretending to be a train driver but falling on the floor, to secret hoping that a train will cross at every level crossing we pass. When crossing Germany I would stop and watch every one of the huge freight trains rumbling by, and in the Eastern European countries I love looking at the old stylish socialist designs. I get sad inside whenever I see disused abandoned tracks, and the great long distance European trains are all slowly succumbing to budget flights and road travel. Ok, so I’m not at the level where I want to start recording numbers and types, but I find them more interesting than cars. Hands down I would rather make any journey by train and some of my best travel experiences have been on train journeys, why anyone would want to take a bus over a train I can never understand! Any guidebook for Albania strongly recommends that you avoid the train saying they are slow, old and in very bad condition… that’s the best kind!! The older the better, no windows? Great! Slowly travelling across a foreign country when you can hang out of the door or stick our head fully out of the window is the best way to travel (after cycling of course)! 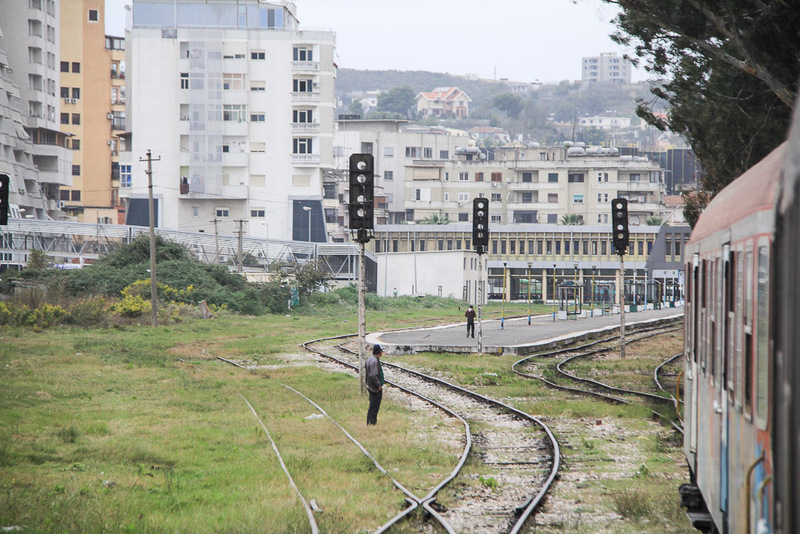 After our extended stay in Durres we decided to take the train away from the coast towards a city called Elbasen…. 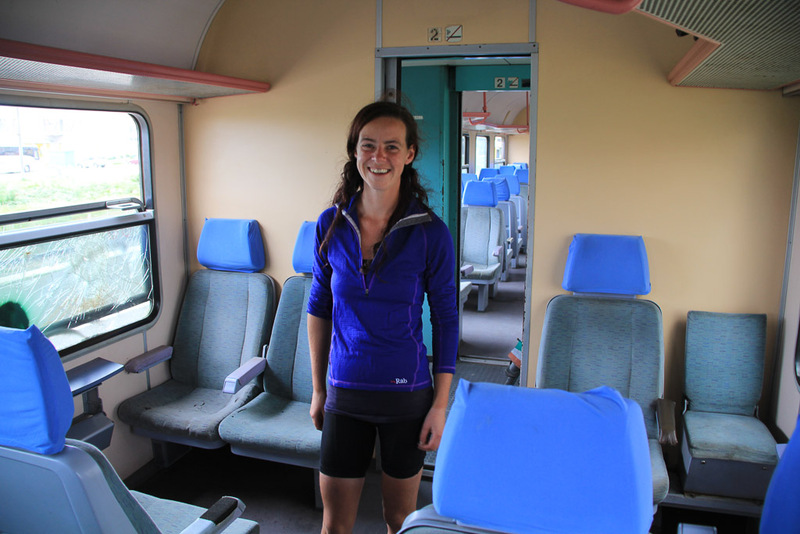 The train would take us away from the busy coast, allowing us to cycle through some of Albania’s mountainous terrain. Elbasan is not a place usually visited by foreigners, but there was one thing there that I really wanted to go and see….. Celiku i Partise or Steel of the Party, a huge sprawling largely abandoned metalology plant established during communist times that was/is responsible for one of the worst cases of environmental pollution in Europe. I bought our tickets at the tiny hole in the wall barely big enough to look through at the station in Durres – something quite bizarre considering the size and emptiness of the hallway I was in. For less than a pound each for us and our bikes, we had tickets for the five hour journey. The ticket lady seemed to be surprised to see me, and confirming the cost of the bicycle required a lengthy check of old medieval looking worn books. 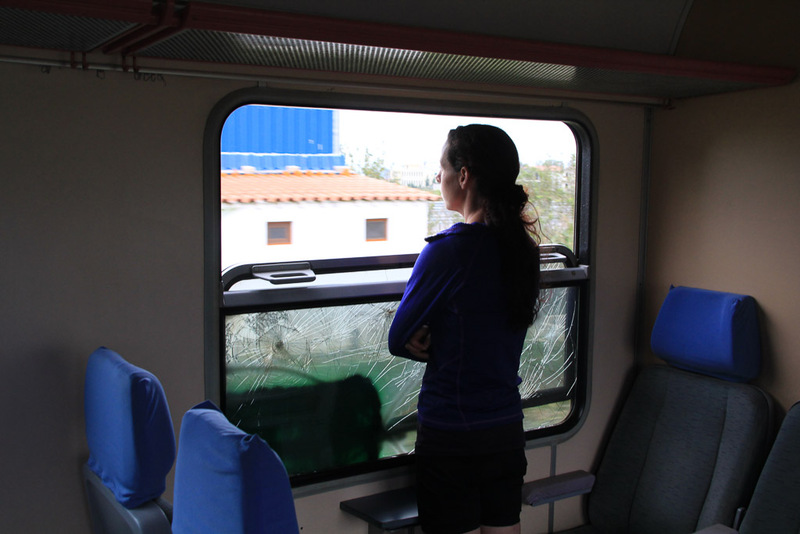 Durres is the end of the line so the train was already there, just two almost destroyed carriages – old Deutsche Bahn trains with smashed windows and no doors. There were just 4 other passengers on the whole train and no one else getting on so we left on time, slowly snaking over the crossroads near the gypsy camps we had been staying no too far from. Hoxha (the communist dictator in Albania) initiated the first railways in Albania back in 1947. 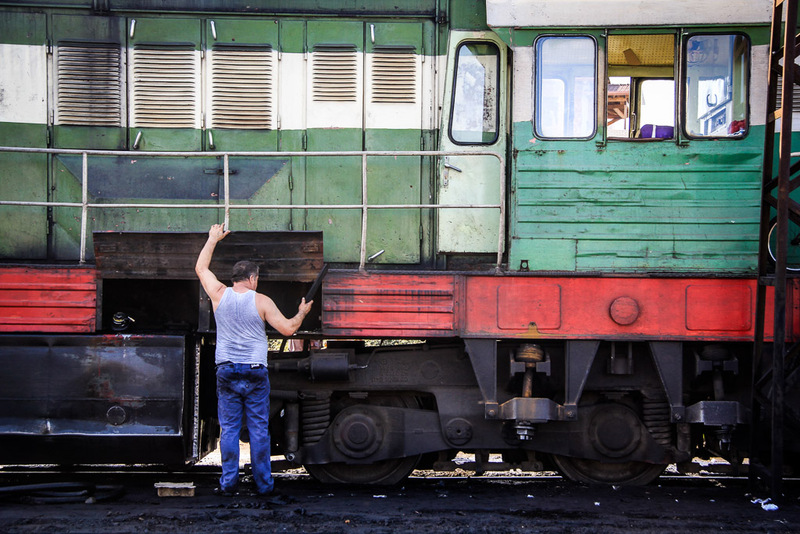 Because the private ownership of vehicles was illegal there were no private cars or buses, the railways were well used and linked most of Albania’s major cities. Following the collapse of communism there was an explosion in private vehicles and the use of trains slowed until the most minimal of trickles. Now the system is in a very poor condition, suffering from years of neglect and lack of funds, gradually shrinking in size as various parts are closed down. Very few trains run per day, the timetable for the whole country lists just six trains that don’t even go to the capital any more. The economist has a blog entry from a few years ago which is better written than ours! The driver had to get off the train to change the track points! The journey was exceptionally slow and with no windows, noisy. It was almost impossible to hear each other over the screeching of the wheels on the rails as we turned bends between small villages and farmland. We passed our time by hanging out of the doors while watching the world go by, and of course by playing the well known Albanian game of ‘spot the bunker’ of which there were many. 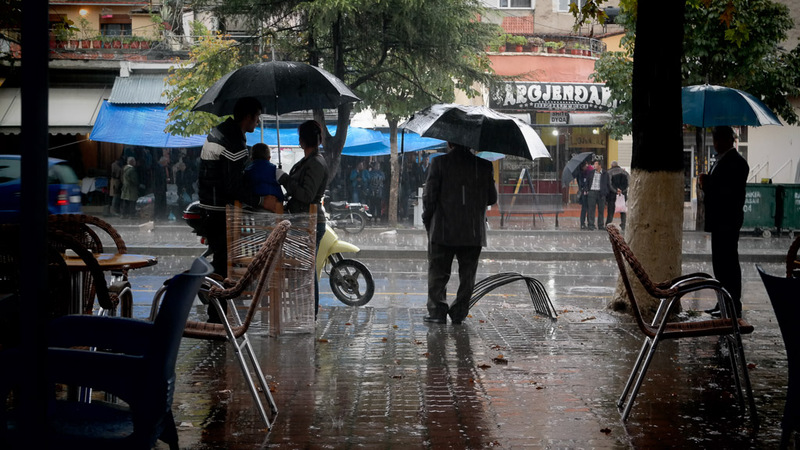 Half way into the journey it started to rain heavily, the water pouring in through the open windows onto the seats – it was strange to have to put on our waterproofs while on a train?! We regularly stopped in small towns, the stations nothing but a scrap of wasteland, no real station buildings or sign that it was a station at all. 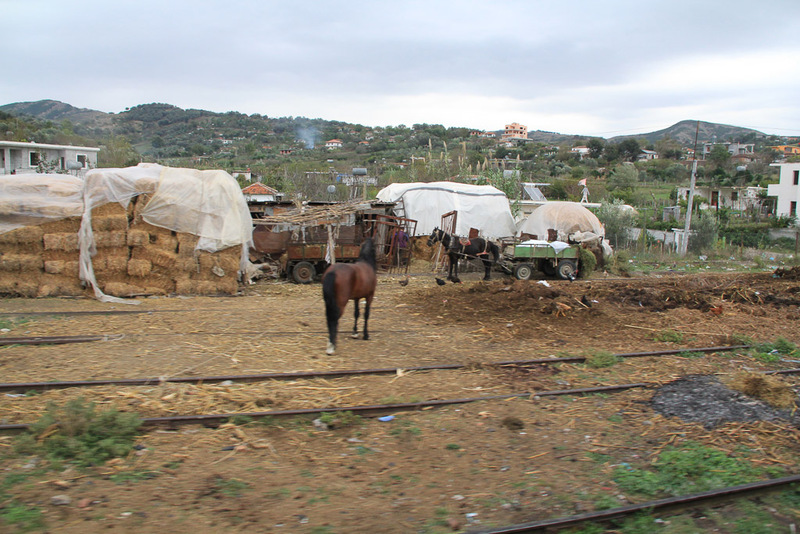 Few people used the train, those that do are the poorest in Albania as it is by far the cheapest way to travel – cheaper even than the buses which are very cheap. Predominantly is was being used by gypsies to transport lots of plastic bottles, and throughout the journey it did not become busy. We were tracking our progress on the phone, wondering how it could take so long to travel such a short distance when the tracks were so straight – progress was painfully slow. At dusk we were trundling up the valley Elbasan is situated in, and about 15km before we arrived we started to pass through the post socialist apocalyptic wasteland that was once Albania’s jewel in its industrial crown. 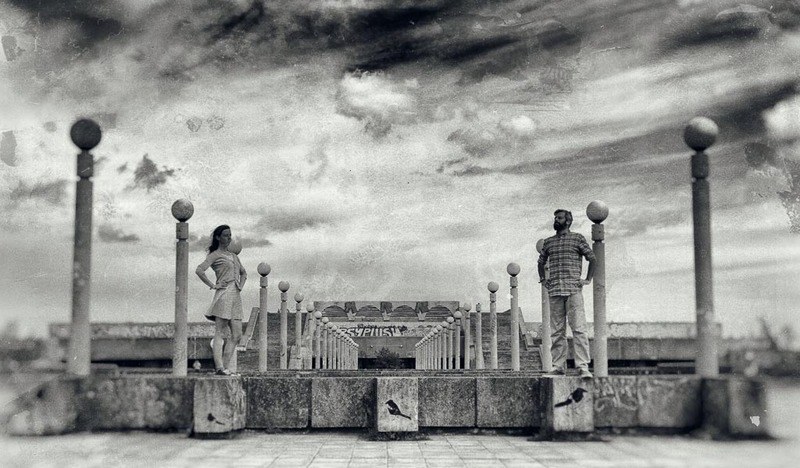 Its huge smokestacks and endless mishmash of cables, buildings, fire and smoke was like peering into an environmentalists vision of hell – far from being abandoned and empty as we had been led to believe, parts of it were still very much in use. Broken windows and missing seats! Any excuse for a coffee! 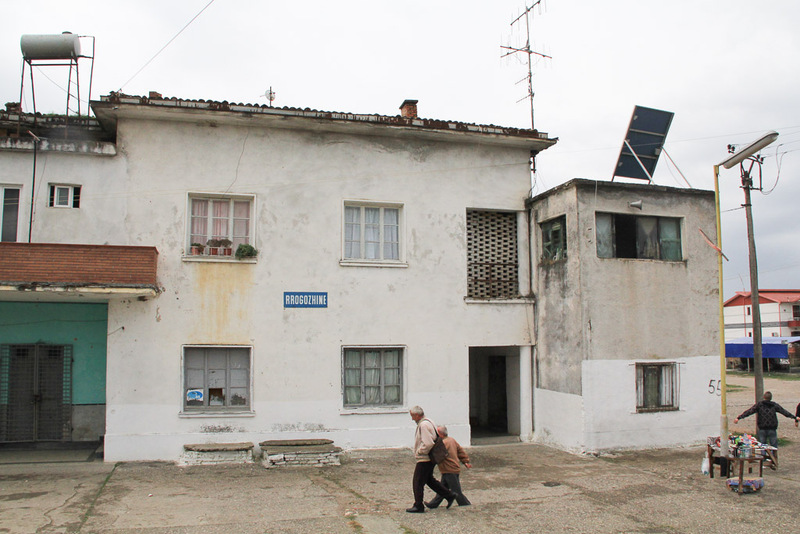 Hostel Edlido is where we stayed in Elbasan – they only opened this year and are the only cheap place to stay in the city. In reality, it is a restaurant who have a few rooms underneath to let out… but the owners are exceptionally friendly and the rooms were nice. If you find yourself in this town then we highly recommend it as a place to stay. They don’t seem to have a website, we had contacted them through facebook prior to arriving and paid 8 euros per person. ← The best mince pies of 2014 were from?